Is your laundry room one of those rooms that you close the door on and pray no one enters? For many people it can be an absolute mess. The good news is that there are simple things you can do to make your laundry room more organized. 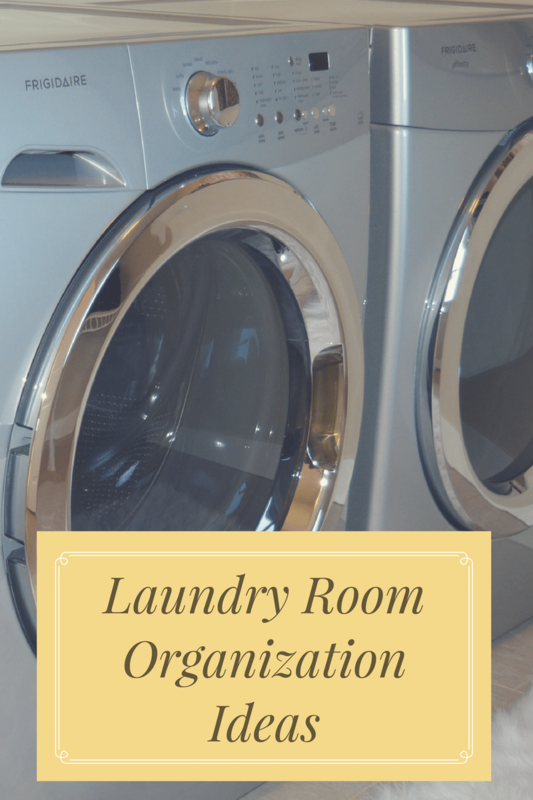 Read on for several useful laundry room organization ideas that you can implement to keep the room more organized as well as more functional. Looking to cut-laundry costs? Check out these 9 simple ways to save money on laundry.
. Label one whites, one lights, and one darks. This makes it easy for everyone in the family to sort their own clothing. If you're going to wash it, the least they can do is sort it. for hanging your spray cleaners and stain removers. Any sort of bottle with a spray handle will hang nicely on a tension rod. This makes it much easier to grab what you need and you can store small things, such as fabric softener sheets, under the bottles. See how to make your own fabric softener for pennies per load! to your laundry room, you can quickly fold your clothes as you take them from the dryer. Check yard sales, thrift stores, etc for a table that fits the area. You can always paint it a new color to match the room. for each family member, and label each bin with that family member's name. As you fold the clothes, sort the clothing into each person's bin. Let everyone know that their laundry is ready once you are done folding and sorting the laundry into the bins. Then family members can get their bin from the laundry room and put their clothes away. If you're washing the laundry, they can put their clothes away. These simple laundry room organization ideas really can make a big difference in how your laundry room looks and functions. Best of all, a few of these tips will get your family involved and take some of the workload off of you. Check out these smart laundry routine tips to help stay on top of your laundry pile. My laundry room is an absolute disaster! It’s complete chaos and I have no idea where to start. SO these are some great tips and ideas to help get my laundry room looking good. I can use good tips for every room. Things get cluttered up quickly. Thank you for the tips. My laundry room is very small. I wish I had a cabinet above my machine. It’s not attractive. Thanks for posting! Never seem to have enough room for what’s got to go in there . Wonderful ideas to make laundry care an easier chore to tackle! I don’t have a laundry room right now. My kids think the laundry room is their spot to dump everything ! This poor room,things just get thrown in,notjibg organized or separated,to have it clean would be super ! Thank you for sharing. I have a very small laundry room. I am currently putting in cabinets. I love the rod for spray cleaners idea- I will definitely be adding that to my laundry room overhaul. Love these ideas!! I wish we could take out our cabinets and put shelves in our laundry room!! I have no room for anything in these stupid cabinets!! I love the idea of organizational bins! !